The overall success of the implementation of our training assisted the company by improving their production by 2 points. This is interpreted as 2% per month of the job closure rate measured to the standard criteria. Financially each point represents $8,000 or $16,000 per month. We have been fortunate to work with Motor Products for 16 months, during which their ROI has increased to $256,000. For over 60 years Motor Products Corporation has supplied fractional horsepower DC motors to original equipment manufacturers in a myriad of industries. And interestingly enough, it has employees who are experiencing between 20 and 40 plus years of employment. The company, a small town employer where many are related and change never happened was sold to a public company where change is survival. The transformation and the new changes practically paralyzed the morale of the plant workers. To reestablish trust and respect throughout the entire plant. To change the managerial style from reactionary to proactive and progressive. To improve communications between supervisors, managers and union officials. To reduce employee turnover with the hourly workers and hire smarter with seasonal workers. To establish and standardize the human resources system. The Human Resource Department announced that everyone in the plant would participate in completing a ProScan® Survey and would meet with Don Crosby, PDP Representative and consultant, for a 15 to 20 minute personal session. Motor Products made the commitment for each of its 9 assembly lines to experience a four-hour team development session. Motor Products invested in ProScan®, JobScan® and TeamScan® modules and in training for the President and Director of Human Resources. With the success of the team development sessions, approval was given to do team sessions with each remaining department. Meetings with a consultant and implementation of the JobScan and TeamScan to understand successful dynamics resulted in a serious downsizing. Once the behavior of inventory and organizational structure was understood the TrakStar Employee Appraisal System was put in place for the 34 salaried staff. The consultant set-up the system and met with each of 7 executives to determine evaluation factors and provide them with a basic evaluation training. Understanding Personal Strengths PowerApp® workshop was scheduled for September 2004 for 34 salaried staff. The approval of Developing Effective Communication Skills PowerApp workshop was scheduled for the hourly 161 employees in late 2004. Approval for implementing the TrakStar Employee Evaluation System has been granted for all of the remaining 161 employees with one set of factors and established corporate goals. 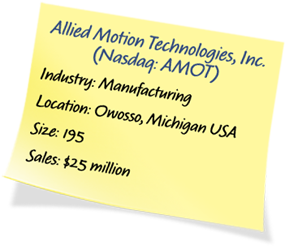 Motor Products has been recognized by the parent corporation, Allied Motion, as their most successfully organized operation. This resulted in approval for a duplication of the Motor Products system for all other manufacturing plants. The services of team training came at the beginning of the change era. In conjunction with personnel development Motor Products implemented new product designs and aggressive changes with the built processing. The staff development factor launched the essential functions to make the process more tolerable and successful.